Construction is a temporary affair, a logistical operation primarily concerned with the flow of materials and labour. To that end, the elements found on most construction sites—hoarding, orange pylons, generic trailers—are purely functional structures to be hauled away once a project is complete, without much thought put into how they look. But multiplied by hundreds of construction sites across cities, these trappings of construction become ubiquitous and seemingly permanent objects, floating from one site to the next like so much urban flotsam. What if more attention were paid to their design? Could design improve conditions for staff working long hours on-site, maybe give construction a friendlier face? These are the questions that Powers Construction, a Vancouver-based construction management company, has tackled over the past few years. For founder Patrick Powers, elevating the lowly site office—the one small haven of human comfort on a building site—seemed like a good place to start. In 2013, after years of working out of trucks and site-built plywood shacks, Powers began outfitting steel shipping containers with large glazed walls, modern furniture and artist-commissioned paint-jobs. After modifying five or six of these, the team felt ready to liberate themselves from the structural constraints of the container module. They envisioned the next version—dubbed the Site Shack—as a pitched roof, wood-framed structure covered in weathering steel. Powers worked closely with staff member Ryan Arceneaux (who is both a project manager with Powers Construction and a designer with Measured Architecture) through a year-long prototyping and building process alongside one of their active residential construction sites in East Vancouver. 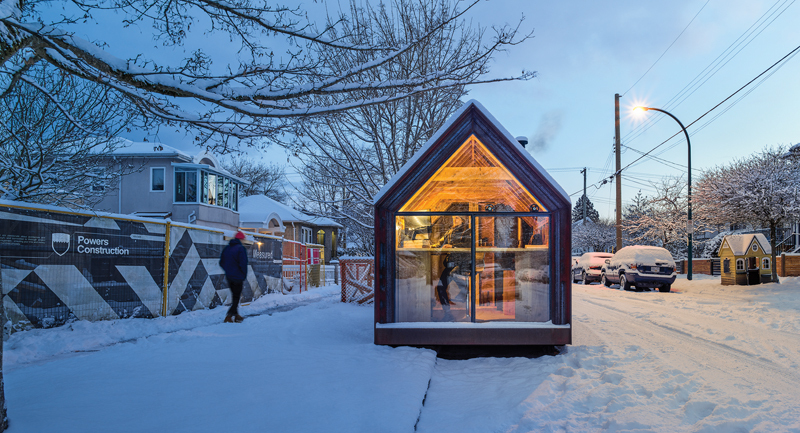 At just 96 square feet, the Site Shack is a compact and hardworking space that balances its necessary functionality with a playful form and crisp architectural details. Inside, the cozy warmth and rustic smell of a wood stove are pleasant and inviting. The Shack is constructed from 2×6 fir framing over an HSS floor assembly, complete with crane hoist-points. On the exterior, plywood sheathing is covered with two inches of exterior insulation and clad in 1/8” Corten steel, expertly welded with no visible fasteners. One end of the Site Shack is enclosed by full-height glazing with a big sliding window for ventilation. The other end has a nearly invisible insulated steel door. The wood framing is left exposed on the interior, providing ample storage space within its depth for tools, binders, and rolls of drawings. A built-in desk hugs the window, and a custom stove enclosure made from steel cladding offcuts completes the interior tableau. Following completion in 2018, the Site Shack enjoyed a short holiday as a staff retreat in the BC wilderness, before getting back to work as a site office late last year at a residential site in Vancouver, where it will live for the remainder of 2019. It’s surprising and refreshing when this level of care and attention is paid to the otherwise overlooked elements of our built environment. For Patrick Powers, the Site Shack is an investment in his team and a powerful marketing tool for company culture. On a larger scale, this small project ups the ante for all contractors, and reframes the construction site as a unique opportunity for design and experimentation. Courtney Healey is an architect and writer based in Vancouver.